Finally, there’s a luxuriously natural way to eliminate unwanted body hair! This sugar wax inspired kit contains 100% organic ingredients. The ancient method of homemade sugar waxing originates from north Africa and is an easy way to remove unwanted hair while also being kind to the skin. With moisturising ylang-ylang, sugar cane and glycerine combined with calming and soothing water flower and chamomile – now any at-home waxing session can have that sensuous spa feeling. Sugar cane has been used in beauty rituals in the Middle East for centuries. Aside from its wonderfully sweet scent, sugar cane holds powerful nourishing and moisturising properties. The exotic ylang-ylang flower is native to tropical areas such as south-east Asia and the Caribbean. It is often used in perfume and aromatherapy for its deliciously fragrant and relaxing scent, but it also contains antiseptic properties which help to reduce inflammation after waxing. 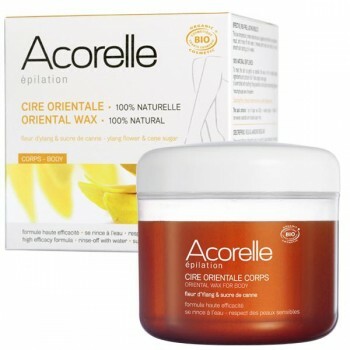 This pot of deliciously scented oriental wax can be used on body and facial hair. It even comes with a spatula for fast and easy application and includes 12 eco-friendly, reusable waxing strips. For best results, follow up with Gutto Natural ant egg cream to gradually reduce hair regrowth over time.